I always get funny looks when I say this, but I’m oddly fond of January. If you’re somebody who likes eating healthily and working hard it actually has a lot to offer as a month 🙂 It’s also the time when musicians tend to get down to projects they want to work on but can’t make the time for the rest of the year round; there’s not many gigs going in January so many of us take to the recording studio around now each year. Early January was spent in Galway with the Lazy Band, a magical few days recording originals and covers in a series of live sessions with engineer Mike Nestor. 3 days, 17 tracks. Intense but rewarding. Next up was a session at Lamplight Studios to put down some strings on Sive‘s new album which promises to be a stand-out collection of original music. Yes, she’s my friend and I can’t claim an unbiased perspective, but I can honestly say hers is a unique talent.Looking forward to hearing the finished product. Then over to Jealoustown Studios for some video shoots with Don Baker. So, all in all, loving January so far. The one drawback? Recording studios, apparently without exception, are freezing in January. As a full-time musician I do a lot of commercial gigs. No apologies for that. Do I love every note I play? Of course not, but who loves absolutely every aspect of their job? I certainly don’t enjoy the bits that outsiders tend not to realise are part of the job, such as lugging speakers in and out of crowded venues, or driving long distances in the middle of the night. But that’s another day’s blogging…. Here’s something I do love. Next week I’m involved in a singer songwriter gig featuring string quartet, a thing called the Bamboo Sessions. 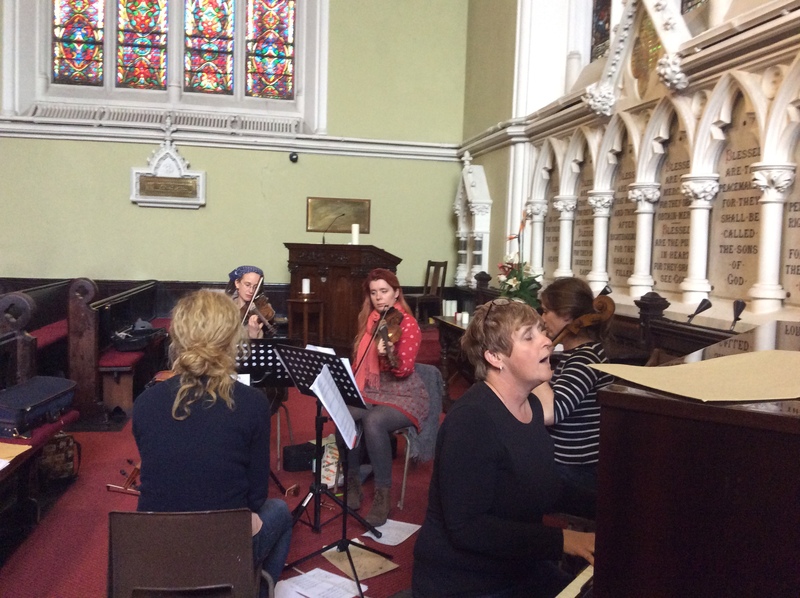 We rehearsed on Wednesday in the gorgeous setting of the Unitarian Church, Stephen’s Green. I sat down with 3 other string players, 2 of whom I’d never met before, and spent the day playing the music of several of Ireland’s finest songwriters, some of whom I’d likewise never met before. If it doesn’t sound self-important I think musicians are rather uniquely positioned in this respect, we can make creative connections with people we don’t know at all if the environment is right. Staging this gig has already been a huge amount of work; for myself, the other songwriters and several string arrangers who won’t be there on the night. We will not be paid a cent, indeed there’s a very strong possibility the event will lose money. But we do it for the love.